If ordering from USA or Canada, please contact Hope Publishing. I am grateful for the opportunity to introduce this new collection. The one-word title, Onward! is a call anyone can respond to, at any age. To quote Scottish singer Sir Harry Lauder, we can all ‘keep right on to the end of the road’. Most of the hymns were written between 2012 and 2015, some of which are hymn-style versions of biblical psalms or significant portions of a psalm, or in response to a verse of scripture. Some older texts have also been included, paired here for the first time with recently crafted tunes. This collection also includes a previously unpublished song I co-wrote with my wife, Susan Heafield, a United Methodist pastor and musician. Praise Partners, our joint musical venture, has released two collections: We Can Be Messengers (Ref PP001) and Tell the Good News! (Ref PP003), both distributed by Stainer & Bell. Onward! 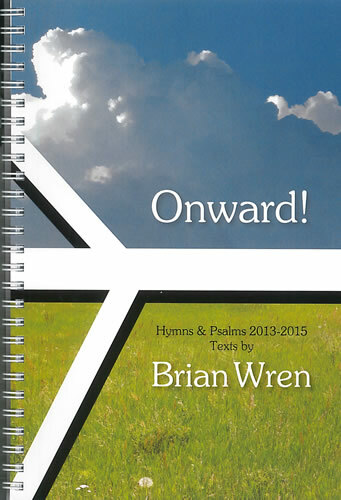 is a collection of hymns and songs by Brian Wren. In it you’ll find a selection of his latest work, as well as some older songs that have been set to new tunes. These are each rich with scriptural imagery, which is the result of many songs having been written in response to a Bible passage, or based directly on one of the Psalms. For some, the best place to find a new hymn will be in a collection such as this, and to you I heartily recommend this collection. Amongst its 40-odd songs (with helpful scriptural and thematic indexes!) I am confident that you will find something that will equip you and your church to worship.